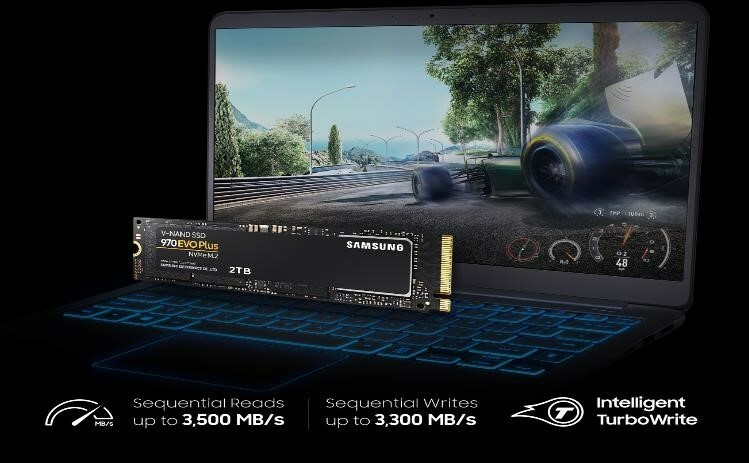 SINGAPORE – Jan. 23, 2019 – Samsung Electronics Co., Ltd. has today introduced the Samsung 970 EVO Plus, the newest enhancement in its Non-Volatile Memory Express (NVMe) SSD portfolio. With industryleading performance and up to two terabytes in capacity, Samsung’s 970 EVO Plus sets a new bar for highperformance storage, enabling IT professionals, tech enthusiasts and gamers to handle intensive workloads on PCs and workstations with more ease. By integrating the company’s most advanced V-NAND chips with optimized firmware, the 970 EVO Plus achieves significant performance improvements – up to 57 percent in write speed – as well as increased power efficiency over its predecessor, the 970 EVO. The new drive delivers sequential read and write speeds of up to 3,500 megabytes per second (MB/s) and up to 3,300 MB/s, respectively, while random speeds come in at up to 620,000 IOPS for read and up to 560,000 IOPS for write operations. The 970 EVO Plus comes in a variety of capacity options; the 250GB, 500GB, 1TB and 2TB capacity versions will become available in March 2019. Manufacturer’s suggested retail prices at S$132.90 for 250GB, S$235.90 for 500GB, S$450.90 for 1TB and S$924.90 for 2TB. For more information, including warranty details, please visit samsung.com/SSD or samsungssd.com. Up to a 57-percent performance increase in random write speed for 250GB version. (2TB). The random write performances after Intelligent TurboWrite region are: 100,000 IOPS (250GB), 200,000 IOPS (500GB), 400,000 IOPS (1TB) and 420,000 IOPS (2TB). Test system configuration: Intel Core i7-7700K CPU @4.2GHz, DDR4 2400MHz 32GB, OS-Wind ows 10 Built 10240, Chipset–ASUS PRIME Z270-A. Five years or TBW, whichever comes first. For more information on the warranty, please find the enclosed warranty document in the package. Warrantied TBW (Total bytes written) for 970 EVO Plus: 150TB for 250GB model, 300TB for 500GB model, 600TB for 1TB model, 1,200TB for 2TB. GB=1,000,000,000 bytes by IDEMA. A certain portion of capacity may be used for system file and maintenance use, so the actual capacity may differ from what is indicated on the product label. Samsung Electronics shall not be liable for any loss, including but not limited to loss of data or other information contained on Samsung Electronics product or loss of profit or revenue which may be incurred by user. For more information on the warranty, please visit samsung.com/ssd.